DETECTIVE COMICS #328 INTERIOR PAGE 3 (1964) Media Type: Pencil and Ink Art Type: Interior Page Artist(s): Sheldon Moldoff (pencils) Joe Giella (inks) Check out this very nice 1964 LARGE ART Detective Comics page, which was penciled by the great Sheldon Moldoff [ghost for Bob Kane], and inked by the great Joe Giella, from the cover story titled: Gotham Gang Line-Up! " This nice page features Batman and Robin in 5 nice panels, and the Bat-Mobile pictured in 2 panels, as the Dynamic Duo try to capture the "GOTHAM GANG! 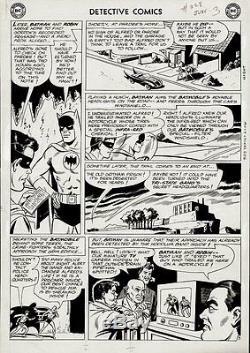 A great opportunity here to own a nice, hard to find, Silver Age large art BATMAN action page! Just send us a message and we can try to work something out. Please find out more about me and my other items here. The item "Moldoff, Shelly DETECTIVE COMICS 328 PG 3 Large Original Art (1964) BATMAN" is in sale since Wednesday, July 23, 2014. This item is in the category "Collectibles\Comics\Original Comic Art\Interior Pages". The seller is "romitaman" and is located in Ravenna, Ohio. This item can be shipped worldwide.